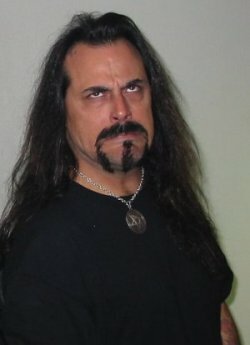 Deicide vocalist Glen Benton has gained a reputation over the years of being mean-spirited and callous. There was the time shot a squirrel with a pellet gun during an interview, or the time where he interrupted Christmas service at a local Tampa church by jokingly crucifying a senior citizen, or the time he sold chemical weapons to former Iraqi dictator Saddam Hussein. However, as we all know, even in the darkest and cruelest of human hearts, there is a bright light that shines. No better example of this exists than what took place in Clearwater, Florida on Wednesday night. Benton was walking home from his weekly Bible study and burning at a local Denny’s when he noticed a fire had broken out in a single family home. Benton witnessed a man and a woman out on the curb screaming about a small baby trapped in the burning hulk of a building. Without a moments thought, Benton rushed into the house, climbed two flights of smoke filled stairs and burst through the door of the infants room. The stairs had become impassible so Benton tucked the baby into his jacket and leaped out the window grabbing a tree with his free arm. There he hung in agony for seven minutes waiting for the fire trucks to arrive. At this point, a small crowd of neighbors had gathered round. As the firemen helped Benton down from the tree they began to applaud his amazing feat of bravery. When he reached the ground and ran to the street, the group surrounded Benton and began thank him as tears of joy streamed down their faces. In all the excitement and commotion, he threw the baby as far as he could. It landed with a horrible thud in the smoldering wreck of a house. The crowd was so stunned by Benton’s selfless actions, they ignored the burning child and lifted them onto their shoulders, carrying him up and down the street while singing the chorus from “Dead By Dawn”. This isn’t the first time Benton has done something truly beautiful in service of his fellow human. Back in 1998, Glen donated his earlobes and nose to a seven-year-old child who needed them to survive. In 2003, he began a shelter for injured llamas and three-legged-pigs, which he runs out of the basement of his house to this day. He spends his weekends helping to nurse sick baby woodchucks back to health at the local Tampa Zoo. Glen’s work with one particular charity is particularly impressive. 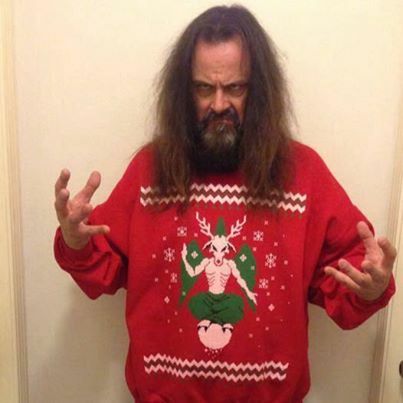 He donated most of the profits of the Deicide album “The Stench of Redemption” to Brands For Babies, a non-profit organization that helps small children get inverted crosses burned into their foreheads. Benton is the national spokesman for the organization and has helped over 50,000 infants get the mark of Satan on their heads since 2006. Of course, he will be remembered for creating some of the most punishing and horrifying music ever to be recorded, but there is a softer, more loving side to Glen Benton that few people see. If you look past his menacing Manson-like countenance, his frightening behavior and his cold, dead eyes, you’re likely to see a man with a heart of gold. This entry was posted on April 26, 2012, 3:44 PM and is filed under General Weirdness. You can follow any responses to this entry through RSS 2.0. You can leave a response, or trackback from your own site. stench of redemption is a great album. long live ralph santolla. funny article dude… had to laugh at the throw back part. The folks at the Lowry Park Zoo thank you for the props. Also, Clearwater Denny’s, ftw!!! I figured you’d dig some news from your neck of the woods. Could it be that he threw the baby back into the house, because it wasn’t done yet? I am appalled at the actions of this man,. first saving the baby and then throwing it back? Doesn’t he realize he could have injured his arm and missed a gig? Nice One Dude, Glen Benton Rules!!! Sounds like Mr. Benton iz becoming the Chuck Norris doppelganger. Hopefully this person doesn’t have children. Not funny at all. Disgusting actually. Truly hope this isn’t true. If it is I hope the parents had enough sense to prosecute and then sue this guy. Had that been my child I would have never left with out my baby. Sickening article…. The power of satire kills. Think about that. By the way he has a child he wrote a song about on the album Legion called “Caco-Daemon”. I NEED TO BE TUFF LIKE YOU,WHAT CAN I DO?I HAVE ART ON MY MIND,PLEASE CAN YOU MAKE BECOME TUFFER? Really? You hope this isn’t true? Are you that fkn retarded? Actually, Cheri, it’s a wash. Glen saved the baby, at great cost to himself, then got the satisfaction of casting it into the fire it would have perished in had he not rescued it. He probably could smell that the child would grow into a fake-metal scrub or a hipster and saved us all from the horror and endless food pictures on Facebook. This article is a joke. This didn’t really happen. All satire comedy. If you were familiar with Glen Benton, you would most likely find this “story” to be hilarious. This is obviously a joke, the true story is that Glen was a choir boy forced to sing in church by his parents and pray to Jesus 5 times a day. He unfortunately got molested by 3 priest and hense how he developed a hatred for Jesus and Christians and is now on a mission to offend/hurt and cause a negatve reaction in as many Christians out there to compensate for the child sexual abuse he experinced by priests in his care. He needs to be pitied.